One of the reasons for the "cumulative impacts analysis"
Policy Act is to look at large scale impacts, such as of migratory birds. contamination caused by all of these well pads. (see map below). Please consider the cumulative impacts to air quality of all of those compressor stations. I would estimate the average air emissions for a station is in the range of 50k-150k tons per year in GHG emissions. I have indicated two sites if interest to me. 1: Brown Star is the Seneca Falls Landfill in Seneca County, Waterloo, NY. 2: Black Star is the i3 Electronics / Huron Campus waste treatment facility in Endicott, Broome County. to minimally treat and release up to 80,000 gallons per day of extremely toxic landfill leachate originating at Seneca Falls and Broome County landfills. 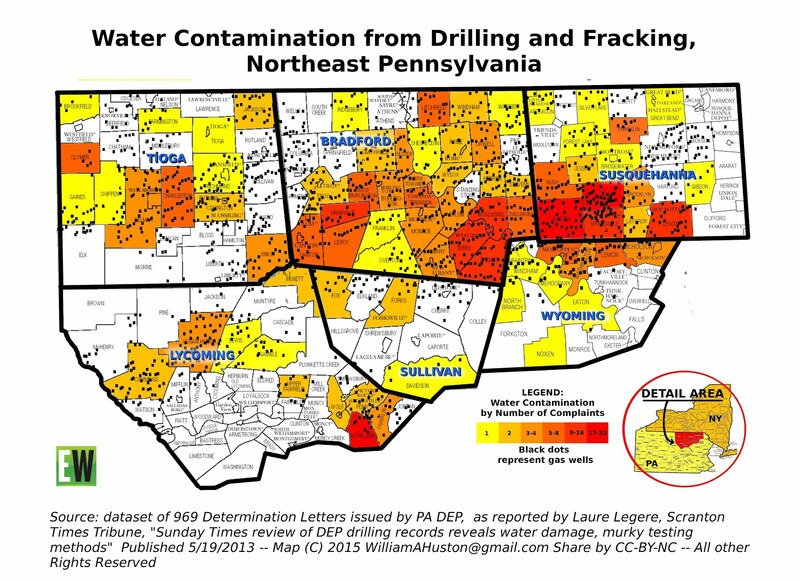 We know that Seneca Falls Landfill has accepted over 5,700 tons of drill cuttings from PA gas wells. Birds eat (among other things) insects. Ask yourself if the insects this year have been normal. My observation is that in central Broome County, the insect population is very low. I have regularly monitored a water crossing downstream of the i3/Huron outfall location. I can remember times perhaps 7-10 years ago, in late June to mid August seeing huge clouds of mayflies swarming near the river. For the last two years I have seen almost no bugs. Almost no mosquitoes. If there are no bugs to eat, there will be fewer birds. a "die-back" or commonly called a mass extinction, before our eyes. w/r/t bug and bird populations last few years compared to say a decade ago. Each spring and summer during the 13-plus years we have lived at our Morris farmstead, we have welcomed scores of yellow finches at our feeders. This season there has been absolutely none. I've contacted NY Audubon in search of an answer, but have had no response as yet. Anyone out there in SO know what's up?